It's almost the end of the year and that means everyone is making a list of the top of everything in 2012. What was hot? What wasn't? Well, I've compiled my personal 12 favorite fashion trends of 2012 in no particular order. Here they are. This is one of the big trends of 2012. It's a classic that has made its way back into the mainstream this year. Previous seasons fashion's early adopters had already started to wear this look but 2012 saw a huge rise in peplums at most retailers. Multi-colored, tribal inspired patterns were all the rage in 2012. 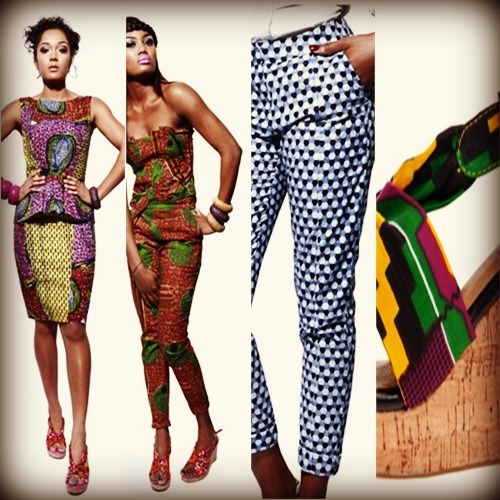 Everything from handbags to accessories and dresses saw traditional African prints used. Luxury design houses and fast fashion retailers were all taking advantage of the African pie when it comes to this trend. Pencil skirts, peplum tops, slouchy harem pants and bold accessories took inspiration from African patterns. High end and even luxury designers were using the influence of the continent in their collections too. Fashion Weeks across the continent continue to gain notoriety around the globe and this year Ghana had it's first Fashion Week with Vogue Italia as a media partner. Color-blocking is the trend that just keeps on going. Since last year we've seen this making an appearance on runways, in magazines and on the racks of many retailers. It's a trend that has appeal across all ages and is the perfect way to freshen up any wardrobe. 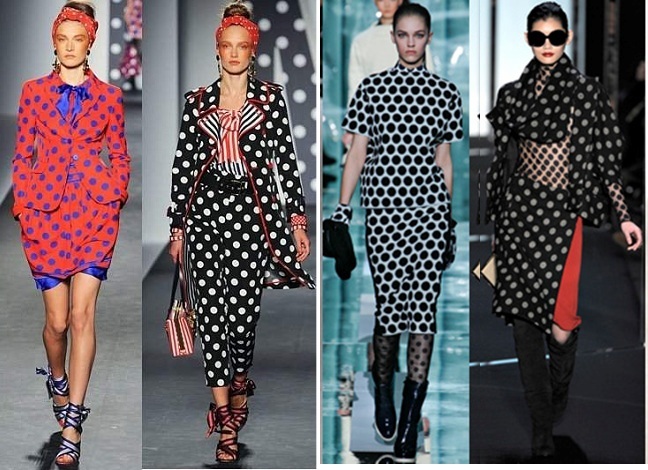 I love polka-dots and this year fashion was hot for dots. It's a trend I remember wearing in high school and now it's back with a new twist. The traditional black and white dots in various sizes and textures are of course top items of the year. But it was the integrating of bold colors like red with blue or mustard with white that made this trend so fresh and new again. Even footwear captured this trend with high style. The dot trend even made its way into footwear. Like these slingbacks by Sam Edelman. Pencil skirts are the perfect item. This is my favorite skirt. Since the days of Audrey Hepburn this timeless item just keeps getting better. Looks great on almost any woman and is sleek, elegant and classy. It can be worn day or night, to work or a party. What you choose to wear with it makes the look complete. Knee-length, above the knee or even below; anything goes with this simple style. Choosing solid colors, prints, striped or dots this look has endless options. Taking its cue from menswear, the tuxedo blazer made its transition into a women's cut a long time ago. It makes a re-appearance every so often and this year it was back again. It's a great option to a cocktail dress at night or wear it casually like some celebrities did with jeans, shorts or leather pants. Denim in bold bright colors made a comeback. Popular in the 80s, this trend was worn by both young and older women. It was the perfect pop of color on a casual day. Dress it up with a simple blazer or crisp white button down shirt. 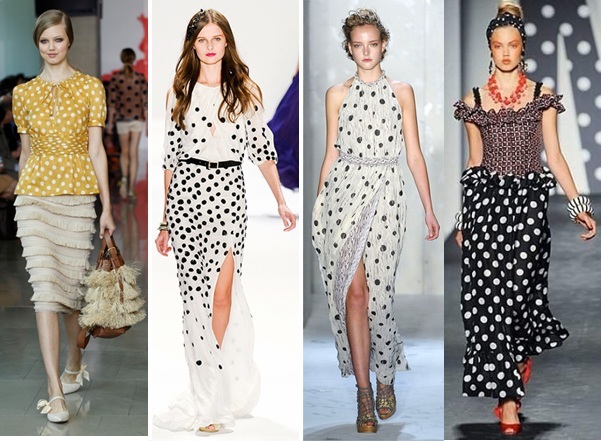 This trend will continue into 2013 for spring. Gold, silver, bronze and pewter. The metallic trend for 2012 is especially popular during the holiday party season. It also was on the world stage during the London 2012 Olympics closing ceremony that featured models wearing sparkly garments from Alexander McQueen. The exquisite look of metallic color took centre stage at the London 2012 Olympics closing ceremony. London's top models strutted down the international runway wearing gold, silver, bronze and other metallics that would add sophistication to anyone's evening. The collection was from Alexander McQueen and represented some of the best of this trend. This isn't the first season metallic fabrics have taken the stage. Not just for socialites, this look is one that will have eyes looking at you when you enter the room. It's an especially popular trend during the holiday season. Models strutt on the world runway during the Olympic closing ceremonies in London. 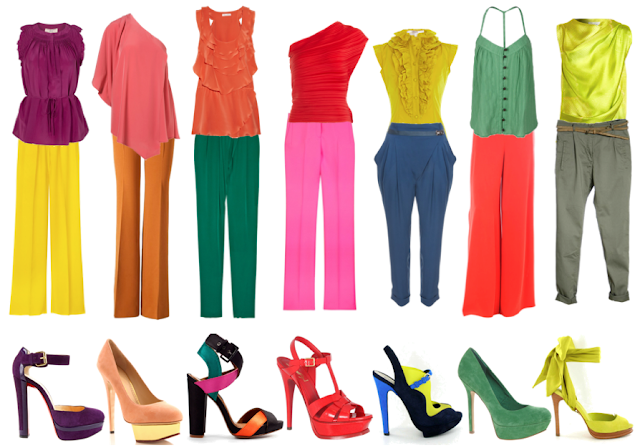 It doesn't matter how you chose to wear it, bright color in any form was definitely it for this past year. From season to season, a bright pop of color remained a staple trend. In gloomy economic times we finally saw some small improvements and what better way to express happier times than with a pop of color. If you weren't brave enough to wear a pair of yellow pants or an orange top then the next best choice for color is in your accessory. Colored belts were very popular items in 2012 and they were the simplest way to add character to your outfit without overkill. Some people may not have the courage to wear bright color from head to toe. In that case this is the next best option. 2012 was the year of the sky-scraping shoe. From Africa to America, fashionistas were strutting in super high stilettos and platforms. In a range of colors, shapes and patterns; the taller the better. It was a trend that looked hot but was also the cause of many accidents and sprained ankles as women did their best to strut in heels sometimes as high as five inches. One of my personal favorites. This trend was a big hit during the 1970's and has made a revival this decade. I own a few jumpsuits of my own and love to rock them with my favorite boots in the fall or with wedge platform sandals in the summer. A very versatile look it can be dressed up with the right accessories or made corporate by simply throwing a blazer over it. This is one of my favorite trends this year.